Writing Home | MK — Typography – Michael King. Welcome to my online writing portfolio. If you’re looking for a writer or editor with considerable experience, you’ve come to the right place. I’ve been professionally involved with all aspects of the writing process, from initial research to final proofreading. I’m particularly interested in storytelling, the arts, entertainment, history, social issues, journalism, and human interest stories of all kinds. 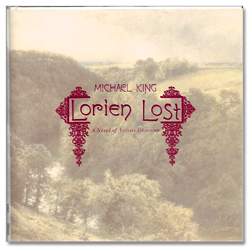 Years ago, I wrote a fantasy novel called Lorien Lost, which was published by St. Martin’s Press. It received praise from Ray Bradbury, my childhood hero whose works have been a great inspiration to me. I worked as an associate editor at a newspaper called Thunder Press for more than eight years, and wrote many articles for them. I also helped edit a series of writing anthologies for a children’s magazine called Stone Soup. I’m highly conversant with the Internet and the online writing environment, and thus am comfortable in the role of webmaster as well as writer. Thanks for viewing my portfolio. If you like what you see, please feel free to contact me. This is the writing website for Michael King, a novelist and editor living in the San Francisco Bay Area. He also works as a graphic designer. If you’re interested, check out his graphic design portfolio .